In deep fat fryer or 3-quart heavy saucepan, heat 1 1/2 inches oil to 375°F. In 8-inch skillet, heat 2 teaspoons oil over medium-high heat. Cook onion in oil 5 minutes, stirring occasionally, until tender. In large bowl, stir baking mix, sour cream and eggs until blended. Stir in onion, cheese, broccoli, red pepper, salt and pimientos. Drop batter by tablespoonfuls into hot oil. Fry 1 to 2 minutes, turning several times, until golden brown. Drain on paper towels. Serve hot. 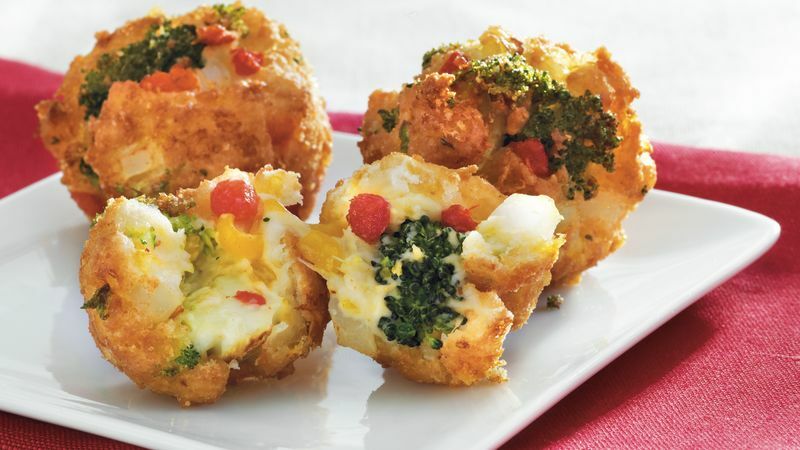 These savory bites would be delicious served with rémoulade sauce for dipping.